Carbon is a fully responsive HTML5 template. Suitable for Business, Service, Portfolio websites. It has clean and minimalist design that is very easy to customize. It comes packed with a whole lot of widgets and example pages. Carbon is completely White label. It comes in a very clean and uncluttered design. Combined with the powerful layout it lets you modify it easily. It is very simple to change all kinds of stuff so you get the design you want. Brand it however you want in no time. 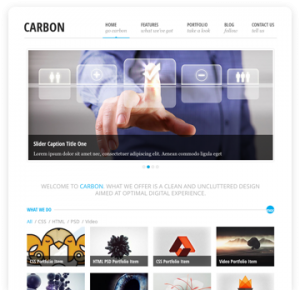 Carbon is fully responsive HTML5 template. It uses very flexible grid system. Building pages using it is super easy and fun. The layout is devided in sections – header, page title, slider area, content, footer. Every area can be full or fixed width. Boxed layout and sidebar examples are included too. We support all major browsers, OS and devices. Carbon comes with Flex Slider – light and fast, easy to set up. It can be fixed or full width. The slider is responsive as the rest of the template. Includes large number of widgets with variety of predefined customizing options. Check the widgets page on the demo site. There is full online documentation for Carbon HTML template available. This item is distributed as is without any support included.